I had some pre-gathered lace in my stash that I wanted to use, but it was too thick at the top. When I snipped the stitches to remove the lace from the binding strip, there was a perfect little tulle-like tube which is great for making stockings on dolls. I can see making little stocking packets with instructions as gifties, using the tulle strips that I found on white, black and ecru lace. I haven't tried it, but I'm guessing that the white strips could be tea- or coffee-dyed too, if you wanted more muted colors. 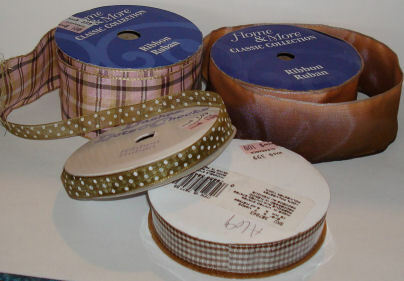 These four ribbon rolls were all reduced to a dollar; great for doll clothing. 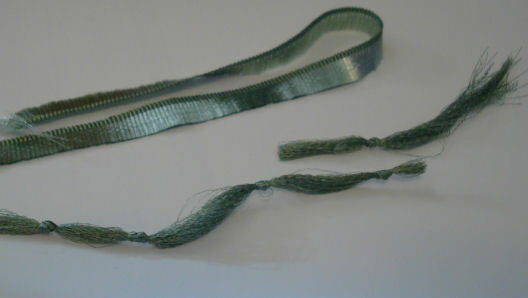 ... and made tassels by tying knots along the entire length of the threads, then cut between them. I wound up not using the pillow with the fringe, but made another one and used the tassels. Waste not, want not, as my mother used to say. I found this wonderful ribbon on sale for 40% off at Michael's and knew immediately that it would become upholstery for another of those many inexpensive red Victorian sofas that I have stashed. I think for the next one I will make the arms more rounded and the seat a bit plumper than the original sofa. This stiff cotton ribbon with the green toile design was also a 40% off purchase at Michaels. Because the design only runs the width of the ribbon, I can't use it in one long piece for a sofa seat. So, the next sofa will require two loose cushions on the seat to compensate. I am also thinking of painting the wood framework a cream color, too. I visualize a toile sofa in a sun room with lots of plants and perhaps a painted armoire with open doors filled with more plants, old books, dried flowers and bric-a-brac. 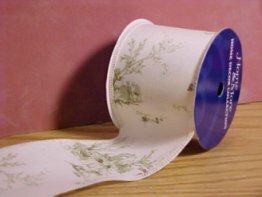 Since toile is often used as the dominant, if not only, fabric, in a room, I will use more of this ribbon to make either a Roman shade, a swag, or balloon valance; perhaps also as a topper over a solid leaf green or a green and white stripe or check skirted table; perhaps also as pillows for a wicker rocker? There is enough ribbon on these rolls, of course, for lots of other purposes, as well. For ease of storage, I have removed them from their cardboard tubes in order to "file" them in ziploc bags in my fabric drawer, which takes up much less storage space. 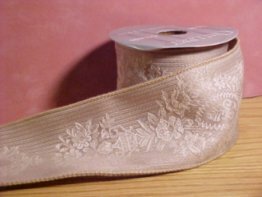 I especially look for these wider ribbons at the after-Christmas sales, where one can often find small brocades, thin velvets, and other fine fabrics that aren't always easily available in amounts or designs small enough for my purposes. These were not ribbons by the yard; these were originally very full ready-made bows that I found at K-Mart after Christmas for 90% off. I untwisted and removed the wire which held them in the bow shape and smoothed them out with my hand. 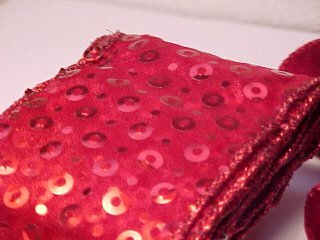 The two solid red bows gave about three yards of very fine, nicely drapeable velvet which would work well for dolls, too.